Whether you want to sell to your sales ready leads or cold prospects, Fileboard makes it easy to import large lists of prospects into the platform. From the Dashboard, click on the More button in the top-center, and hit Lists. 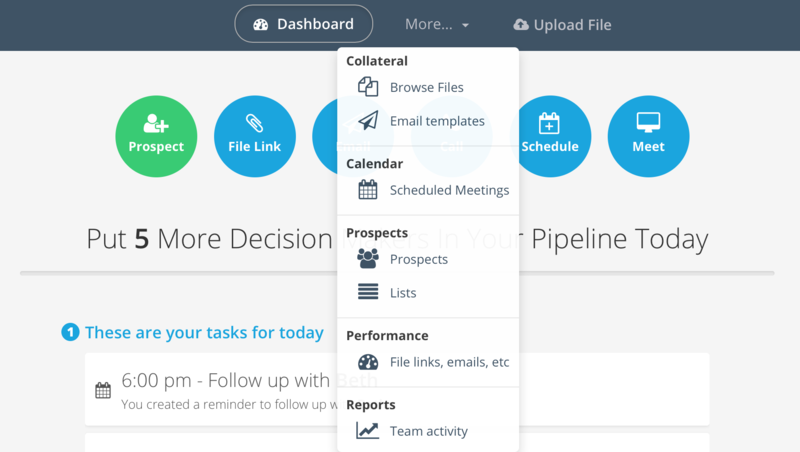 Next, choose a list to import new leads into, or click the blue Create New List button. Finally, select where you want to import your prospects from. If you are using Salesforce, you should always import your lists directly from Salesforce, so that all your actions with your Salesforce prospects are automatically logged on both platforms, saving you time. You can create custom lists in Salesforce to import to Fileboard if you choose. Learn more about how to create these custom lists here. Note: Either a phone number or email address is required for each and every prospect included in your import, regardless of the source you may be importing from. When importing, you can add a prospect’s First Name, Last Name, Title, Email, Phone, Extension, Company Name, CRM ID, and CRM Object. Simply title empty rows in the first column of your spreadsheet with these values as in the picture below, and you can fill them in for each prospect you choose to. Once your list has been imported, you’re ready to put it to work by emailing, calling, or creating a mass email campaign with your new prospects!